This week, the ETF headquarters hosted a marathon of important aviation meetings that set the agenda for the upcoming period. On Monday, the Steering Committee met to prepare the work of the Section. On Tuesday, the EASA Strategic Group discussed the changes of the legislative framework of the Agency, the internal structure as well as current rulemaking tasks. This was followed by the meetings of the three Committees (Air Traffic Management, Cabin Crew incl. Pilot Working Group and Ground Staff) dealing with the specific issues for the individual groups. And on Wednesday, the whole Civil Aviation Section got together to deal with a heavy agenda relating to the defence of aviation workers’ rights. Among other things, it included a new and strong campaign on Ryanair that will be implemented in close cooperation with ITFaviation. Finally, the ETF delegation is attending today (Thursday, 22 June) the Plenary meeting of the Civil Aviation Sectoral Social Dialogue. Among the topics discussed, we have the changes on the employers’ side representation, the EASA Basic Regulation, Regulation (EC) 1008/2008 on air services or the consultation of the Civil Aviation Social Dialogue Committee. 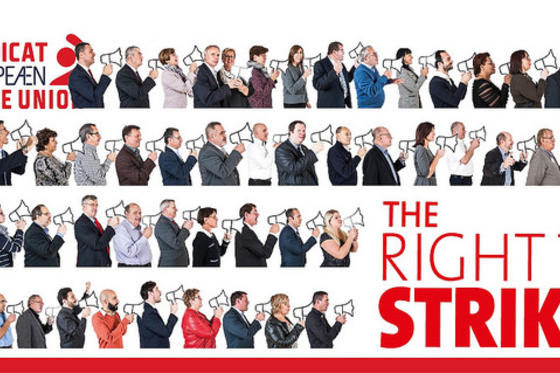 As part of its package entitled ‘Open and connected Europe’, the European Commission announced today its recommendations on the so-called service continuity, including measures affecting the right to strike. The European Transport Workers’ Federation (ETF) strongly deplores this attempt to limit indirectly this fundamental right guaranteed by the EU Charter of Fundamental Rights by proposing measures such as individual notification, protection of overflights and air traffic peak periods. The proposed measures significantly encroach the national sovereignty of Member States and contradict the Article 153 of the Treaty on the Functioning of the European Union which clearly states that the right to strike is excluded from EU competencies. This article must be understood as a whole, including the way this right is being organised at national level. In an earlier study based on official EU data and entitled ‘Efficiency, capacity and growth in European aviation’, the ETF together with ATCEUC have demonstrated that while blaming the air traffic controllers, the airlines themselves are responsible for over 50 percent of flight delays in Europe. Furthermore, the study shows that guaranteeing minimum services, which are in place in several EU Member States, are an ineffective measure. The ETF is also reserved on the proposal to guarantee 100 percent of overflights in countries affected by industrial action and to use air traffic controllers from other countries as strike-breakers. Apart from the fact that this would circumvent the right to strike, it may also have serious safety consequences due to the lack of sector-specific training for these “universal” controllers. The European Trade Union Confederation (ETUC) today condemned the European Commission’s proposal to restrict the right to strike in air traffic control. 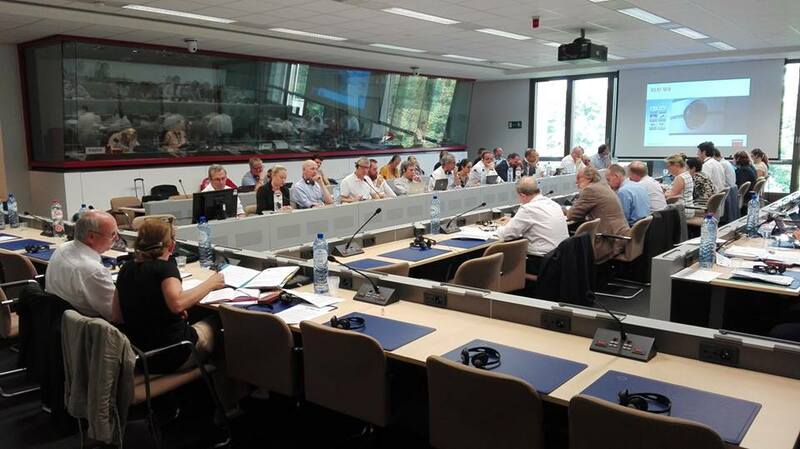 It demanded that the Commission removes all references to restricting the right to strike from its initiative on “Aviation: open and connected Europe” published on June 8. 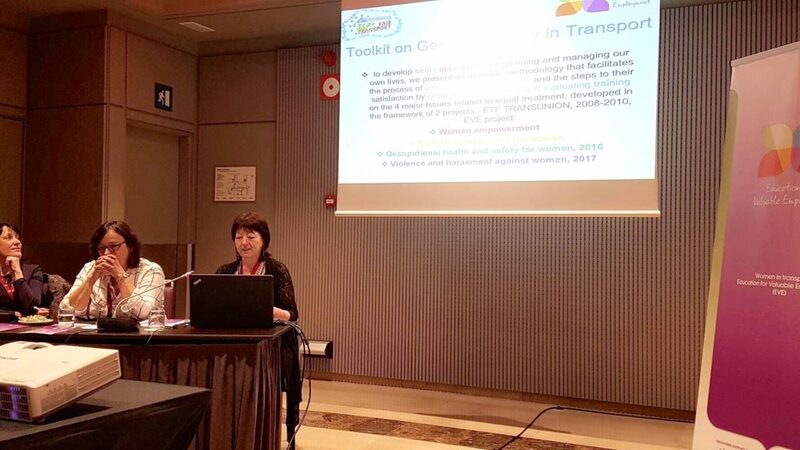 A comprehensive training program on gender equality was presented at the fifth Congress of the European Transport Workers’ Federation (ETF), which was held last week in Barcelona. 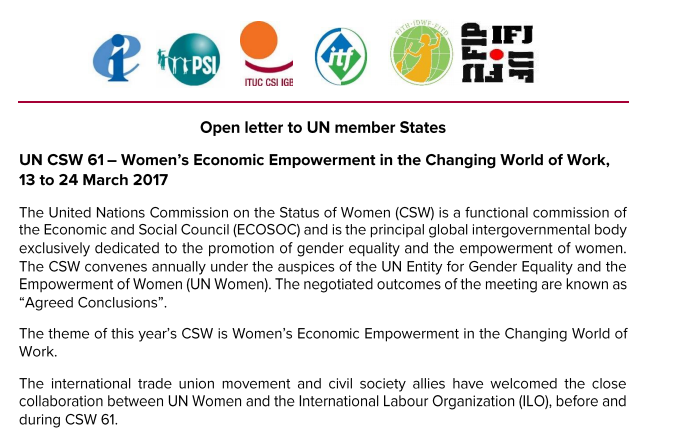 “This is a useful training tool on every level,” commented Diana Holland (UK), chair of the Women’s Committee of the International Transport Workers’ Federation (ITF). 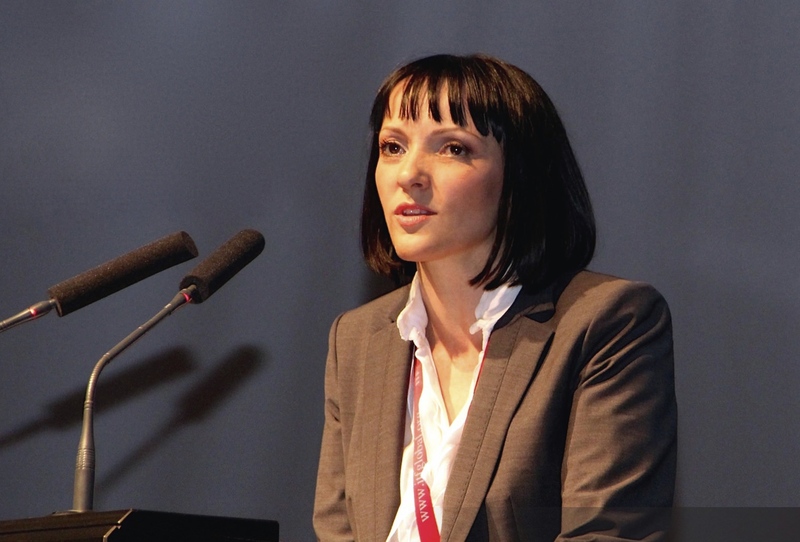 Ekaterina Yordanova gave employers and trade union leaders the Bulgarian edition of the WISE II report and its recommendations for increasing the share of women working in public transport. 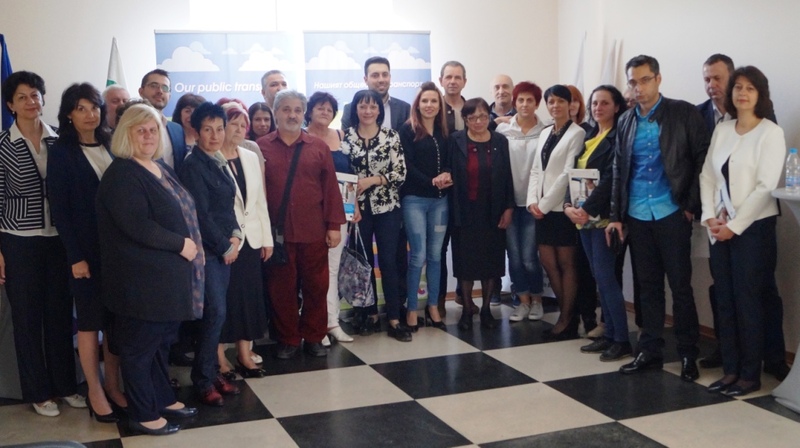 The Federation of Transport Trade Unions in Bulgaria (FTTUB) officially presented the final part of the WISE II project – “Women employment and gender equality policies in European public transport companies”. 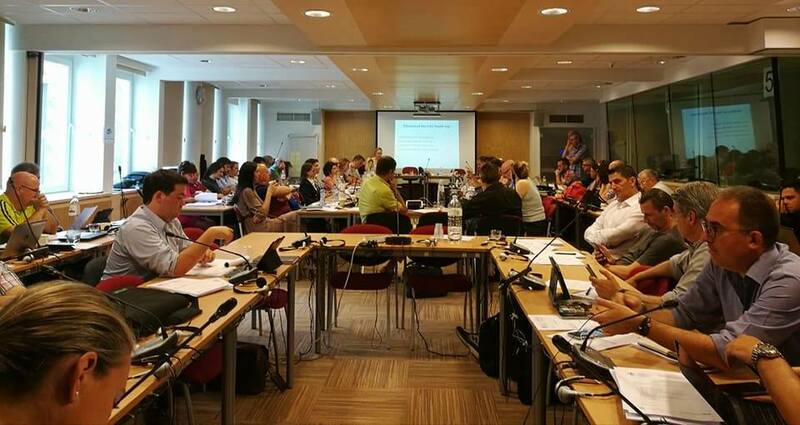 This is a joint project of the European Transport Workers’ Federation (ETF) and the International Association for Public Transport (UITP) within the framework of the European Social Dialogue in the period 2015-2016. 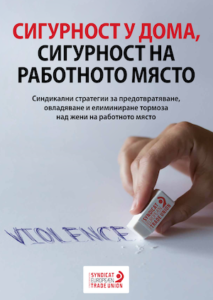 Bulgaria participates in the initiative through FTTUB, with a solid contribution to the research and the preparation of a handbook with policies and good practices for equality. 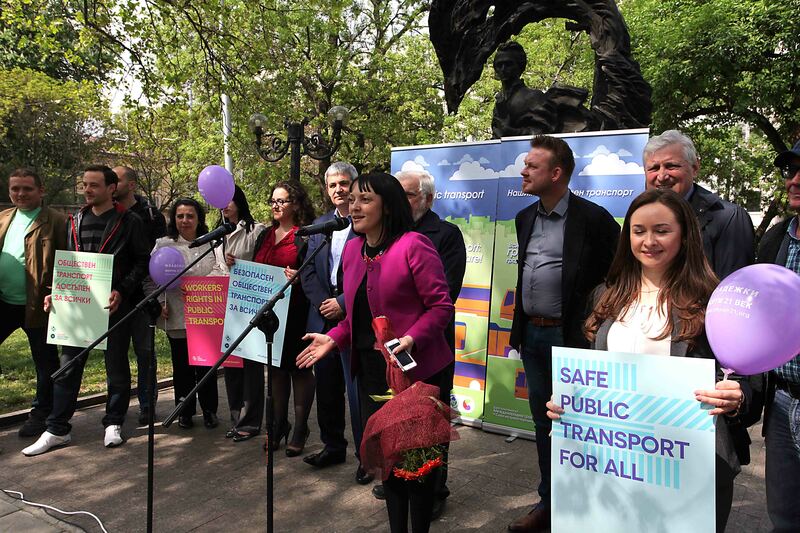 The Federation of Transport Trade Unions in Bulgaria (FTTUB) celebrated Labour Day with the launch of the new “OUR public transport” campaign: an initiative of the International Federation of Transport Workers (ITF) which explains the benefits of public transport. FTTUB president received support from the Confederation of Independent Trade Unions in Bulgaria (CITUB); European Parliament’s support is also expected. The Federation of Transport Trade Unions in Bulgaria (FTTUB) firmly retains its position against the concession of Sofia Airport in any form. This time, FTTUB reacted to the announcement made on March 21, 2017 that the Minister of Transport, Information Technology and Communications Christo Alexiev has issued an order terminating the concession procedure. 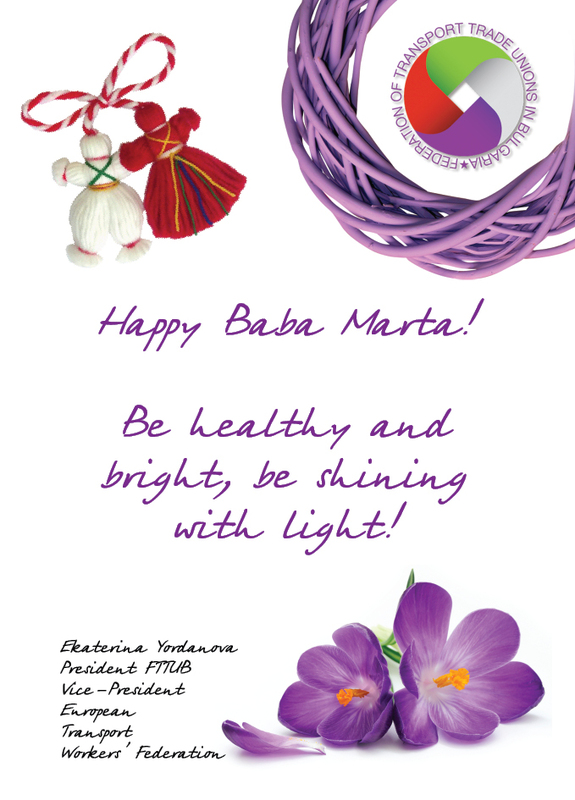 On 1 March we, Bulgarians, celebrate a millennia-old tradition called ‘Baba Marta’ (Granny March). It dates back to our Thracian ancestors and is a ritual for fertility and health throughout the year.